When sewing a jacket, blazer or a coat, do you pay attention to a garment's commodity and if it's gonna enable you a normal body movement? If you could make a minor pattern alteration, that would make the garment more practical and comfortable, would you invest extra few minutes to do it? Today I'm going to show you a simple technique which gives answers to these questions: learn how to add a commodity center back pleat to a jacket lining. 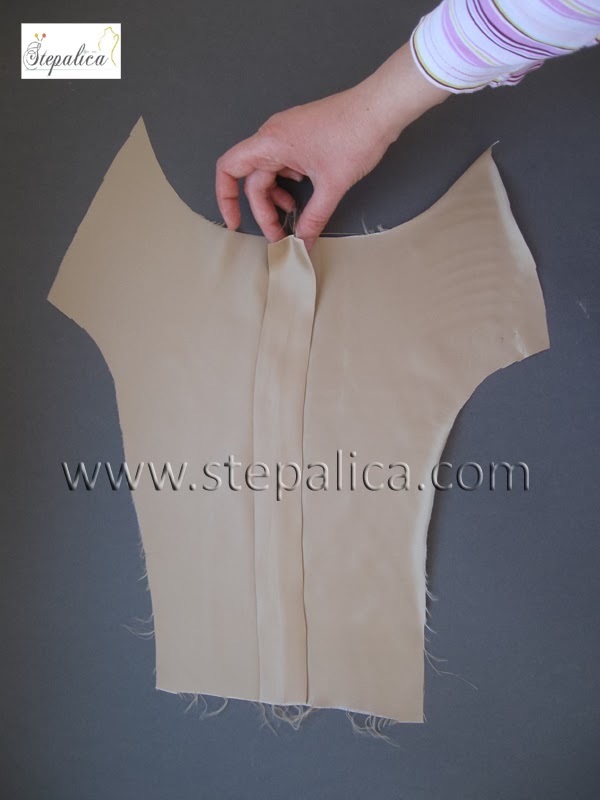 So, the commodity pleat is added to the center back seam of the bodice, and its purpose is to reduce a potential feel of tightness the lining might cause when wearing the garment. 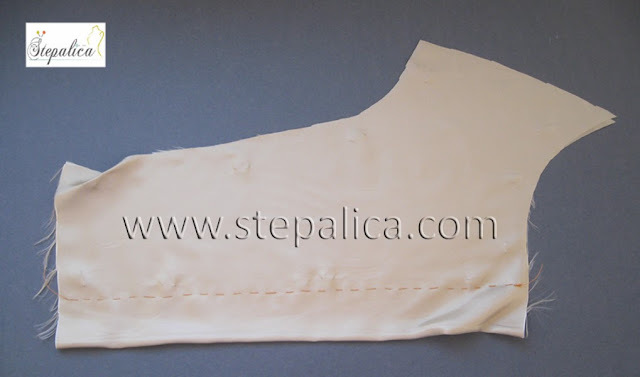 You have probably learnt the lining should have the same dimensions as the shell (which is correct, otherwise it might make bulk under the shell), but this kind of plead does not add extra bulk while it adds that extra centimeters to the widht of the garment, making it more comfortable to wear. 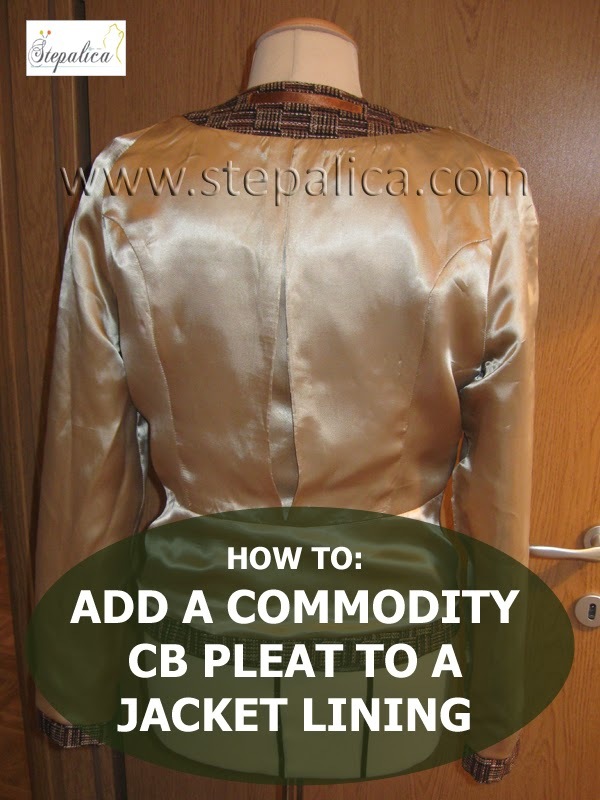 Adding the commodity pleat is quite simple, and it actually does not require altering the pattern itself; all you have to do is change the way you cut a fabric. When placing the CB pattern panel to the fabric, shift it a bit, so that it's placed 4 - 5 cm away from the fabric's fold line, with the straight grain line on the pattern being parallel to the fold line of the fabric. Note that the CB of the pattern I used is a straight line, while the pattern can have a curved line there; however, the procedure I'm describing is identical in both cases. Pin the pattern to the fabric and handbaste along the CB edge of the pattern. Reinforce the basting ends, so that it doesn't rip off. Remove the paper pattern from the fabric. You've gotten a pleat 8 - 10 cm wide. Press the pleat open, spreading its width evenly on both sides of the basted seam. 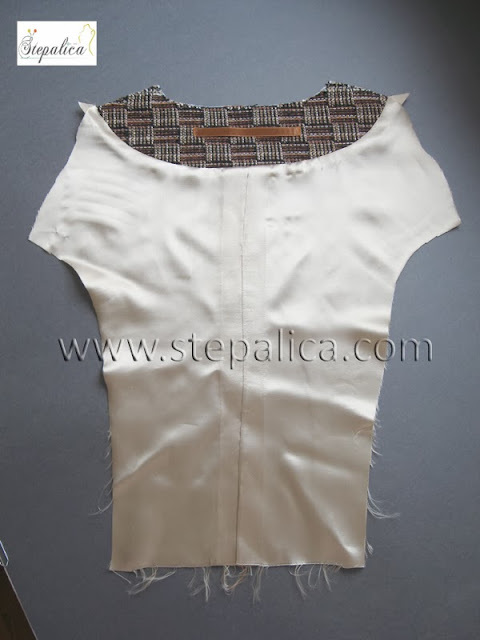 Keep the basting thread until you have sewed the neckline facing and a peplum. If your pattern doesn't have a peplum, but a continuous CB seam, sew the pleat from the waist down to the hemline, leaving the top portion of the pleat just basted. 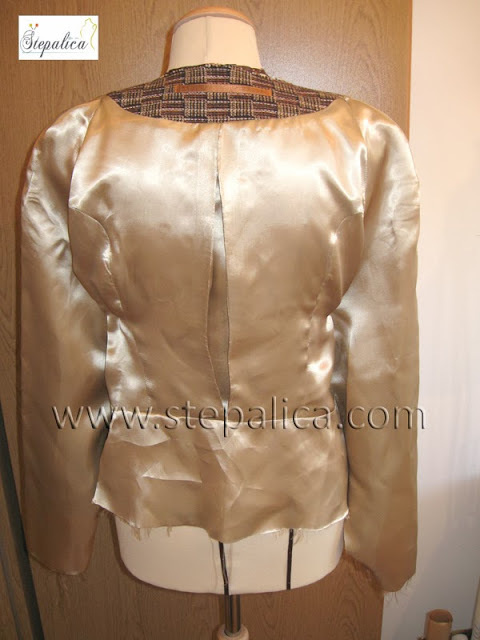 Once you have assembled the lining - both front and back panels, and added the sleeves, remove the basting thread. And that's it! You've gotten a commodity pleat. It wasn't difficult at all, was it? korisno je ovo, ali ja još nisam došla do te faze da uopšte mogu da se ležerno prihvatim stavljanja postave na jaknu. sve me strah da probam, a trebala bih stvarno to da naučim. Planiram da napišem i post o prišivanju postave, ali će morati da sačeka, dok dođe na red, jer je prilično obiman (mada tehnika sama po sebi nije teška). U međuvremenu, nije na odmet znati i neke međukorake, zar ne? sačekaću ja taj post, ne žuri mi se sa šivanjem jakne. You're welcome, I'm glad you found it helpful!